And I haven’t been doing much cooking either. Most of it are really quick food which don’t look good and I don’t even bother to take a picture of it. I just want to eat it, or other times, they’re take-out food. So this one, is made when I haven’t started working full time yet. During my several months of unemployment, I had novelty / celebration cake orders (though I wished they were pouring in instead of crawling in) to make up for my lost of income. And teaching on freelance basis as well. Over time, I noticed the orders weren’t quite stable and there obviously were no classes. (sensitive topic lol, keep for private). Sometimes I could go through the whole month without any orders or classes. Though truly there was only ONE month of it. So I reckon, with the gazillions of other “homebakers selling cupcakes and fondant cakes” popping up, I will just keep this whole thingamajig as a part time job and have an unrelated full time job instead. So I have 2 sources of income rather than an unstable one. *I am NOT condemning other homebakers selling cupcakes and fondant cakes, I just think there’s one too many in the market. I know most does it as a 2nd income because of the rising expenditures, and inflation and whatevernot, but, please, do so with conscience by using good ingredients and no stabilizers, emulsifiers, trans fat and fake essence or flavour. This goes out to not just homebakers but every other person as well. I was trained that way and it’s just my principle I picked up along LCB, if I don’t use good and honest ingredients in whatever I’m making, I’d rather not make it. Simple as that. Not everyone can agree with it, but then, it’s me, not you. 😛 I hope you don’t hate me for this paragraph of honest comments. After all, homemade ideally, should be better, no ? Okay, so that aside, I still am taking in cake orders so I don’t feel guilty about all those tools I’ve bought. Gotta put them to good use, eh ? Talking about the things I’ve bought, I’ve recently bought Nigel Slater’s the Kitchen Diaries. I’ve been wanting to buy the book for years! Really, since I was in Australia. I know I won’t really cook anything from there (just like Nigella’s How to eat) though I know there’s gonna be alot of good recipe in it. I don’t know why it was just being put aside. Until one day I just SO HAPPENED to step into a really cheap bookstore, and found it at a slash price of 60%-70% off. I immediately picked it up, along with other books. Lol. I have been good. I haven’t bought a single book this month yet. I’m bloody good! just 7 days to go right? hahah it’s going to be a clean month. No books. So on to The Kitchen Diaries, I must say it’s been pretty well so far. I’ve read page through page till somewhere mid March. I’ve tabbed a few recipes so far and overall, it’s all about using the right ingredients at it’s right season, though I’m not so sure which season does Pork Chop Mustard really belongs to, Hungry season maybe Hahaha. 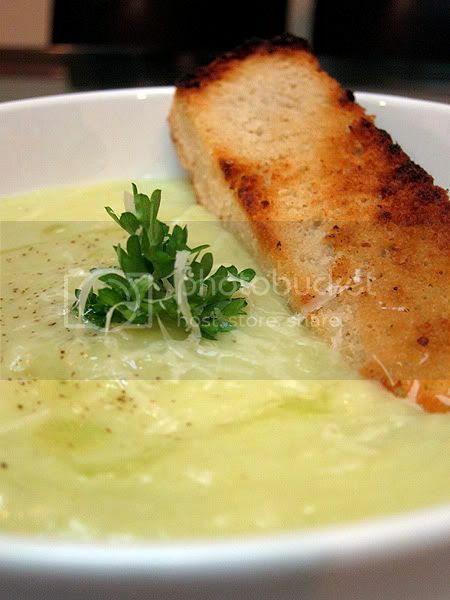 Leek, potato, soup. What could it mean? cold day? Just want to stay at home and watch tv day? &lt;– I have to say, most of the days I would want to stay at home and watch tv. HAHA but you get the idea. I got the idea of roasting the potatoes first before cooking with the leek from British Larder. Roasting potatoes instead of boiling them gives it a better flavour and plus, crispy potato skins are my favourite!! Preheat the oven to 180 °C. 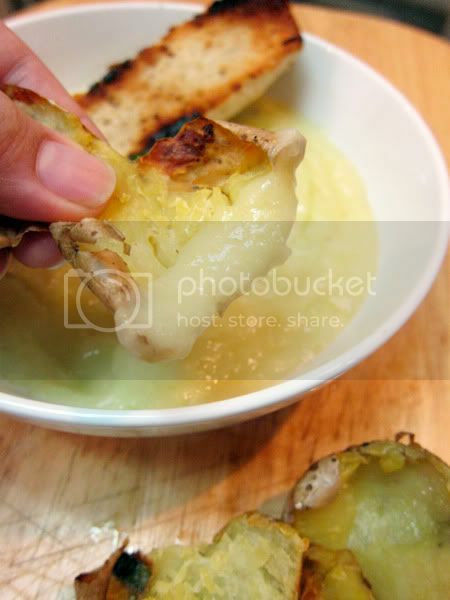 Wash the potatoes, pierce them all over with a fork and rub the olive oil with seasoning over the potatoes. Place them on a roasting tray and roast them in the preheated oven for 1 hour, turning them once during the cooking time. 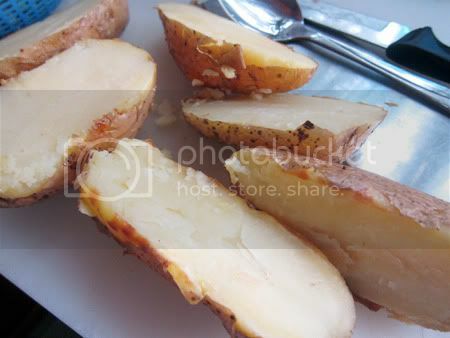 Once cooked let them cool for 10 minutes, cut the baked potatoes in half, use a spoon to scoop the cooked potato flesh from the skins. Rip the skin into pieces, place them on the oily roasting tray, turn the oven off and place the tray in the hot oven, they will become roasted and crisp. 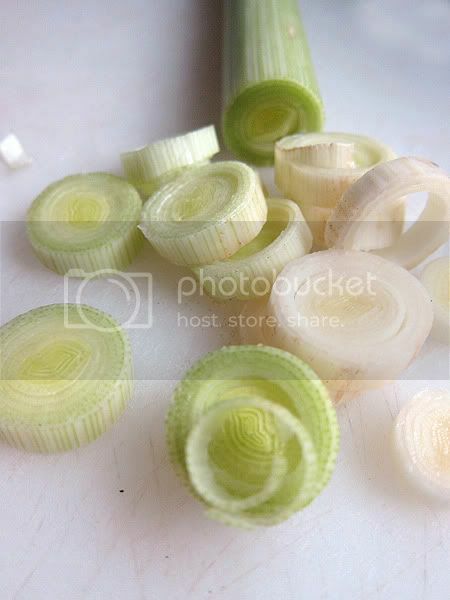 Trim leeks, slice them into rings, then wash throughly under cold running water. Melt butter in a heavy-based saucepa, then tip in the washed leeks and let them soften slowly, covered with a lid, over low to moderate heat. After about 10 minutes with some occasional stirring, they should be silkily tender. Add in the potato flesh and let them cook for 5 minutes or so, before dropping in the cheese rinds and pouring in the stock or water. If you don’t have Parmesan rinds, like I do. I throw in a knob of old and slightly dried parmesan. Either way, if you decide to skip it, it’s ok. Season with salt then partially cover and leave to simmer for 10 minutes. remove cheese rind if you’re using, otherwise just leave it in. Add bits of parsley and blitz the soup in the blender. Check the seasoning. Return soup to the pan and bring briefly to the boil. Serve hot with crispy potato skin and/or crusty toasted bread and drizzle some olive oil with a dash of pepper. Potato skins are very yummy. They’re good to dip in guacamole, soups and even just as it is. It’s crunchy yet still a little soft if you leave a tad bit of potato flesh in it. 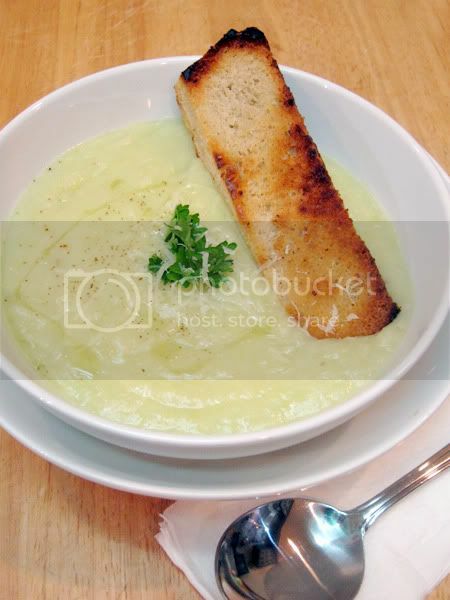 If for the soup, you decide no to roast the potatos, cut them into chunks and boil with leeks till they’re soft to puree.